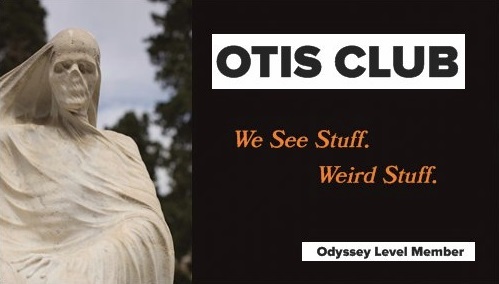 OTIS (Odd Things I've Seen): Is Poe Home? October 26, 2013 — I’ve never flown roundtrip in a single day before. But I did it today. For Edgar Allan Poe. One of the bigger reproaches of my life is that I lived a quarter of a century in the state of Maryland, but had never been to the Poe House. 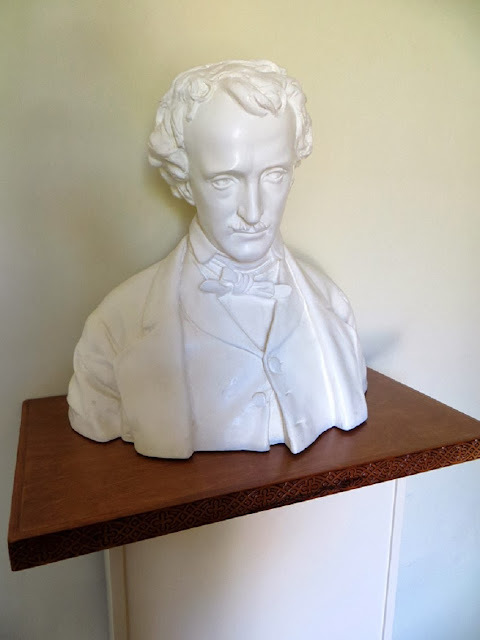 I mean, I discovered his work while living in the state, visited his nearby grave on many occasions, and, while a Marylander, never lived more than an hour and a half away from the Poe House at any given time. Admittedly, that latter might go without saying. Maryland is a small, weirdly shaped state. For a while there I thought it was a permanent mistake. For the past year, the Poe House has been closed for weird, vaguely budgetary, vaguely political reasons. But that changed today for me. All thanks to a nice flight deal from Southwest, my parents, the motivation of the looming deadline for my Poe travelogue, and the Poe House itself coming up for a brief gasp of air. 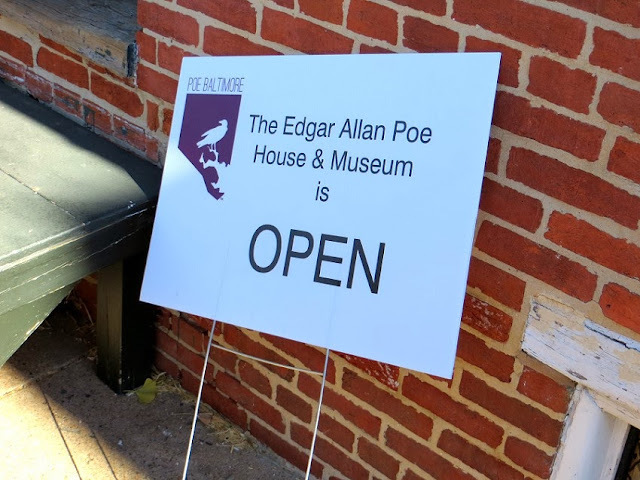 Not wanting to miss the Halloween crowd, the Poe House has opened its doors in October with free admission. The only catch is that’s it’s only been open four hours a day, and only on the weekends. It’s a prelude to the house opening again in 2014, hopefully, permanently. But my book deadline couldn’t wait that long. The line to get into the house was pretty long from the moment it opened. Partly that was the demand for all things Poe, partly the limited hours after being shuttered for so long, and mostly because they can only allow 15 people at a time into the house. 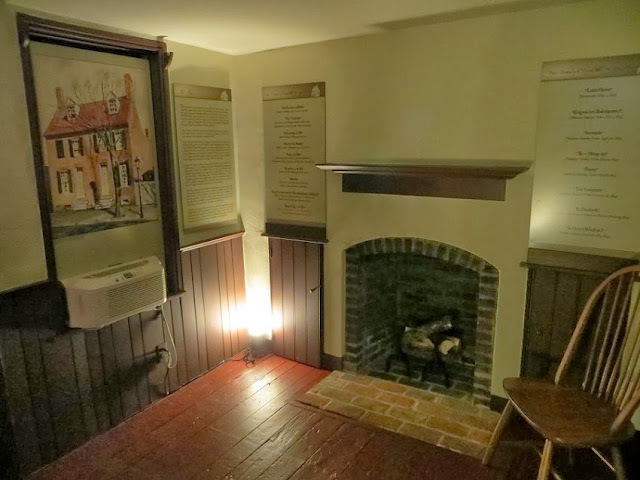 Poe lived there in the early 1830s with four of his relatives. It was half of a freestanding duplex at the time, an artist’s rendition of which you can see in one of the included pictures. The place has three bedrooms upstairs and two small rooms below. While he lived there, he couldn’t have put more than three words together without slinging ink at a housemate. However, despite its humbleness, this is the home where he met his wife. 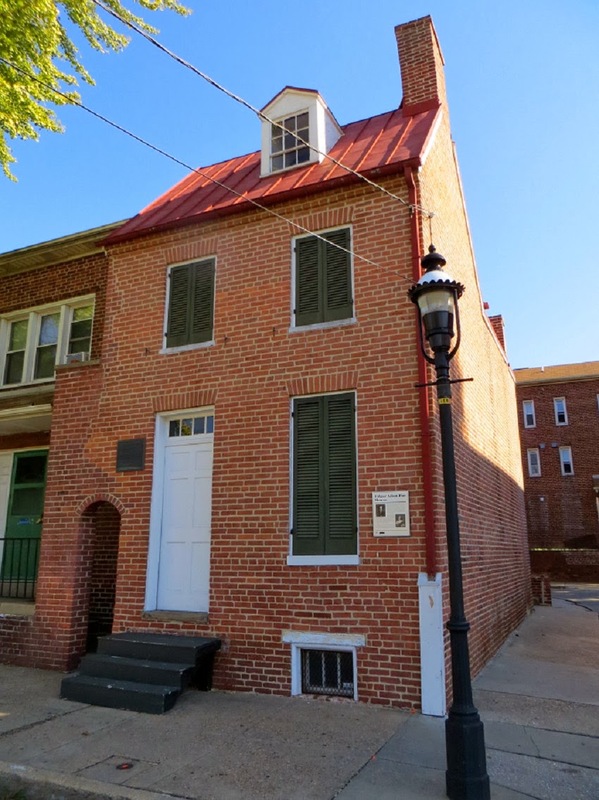 The home where he wrote Berenice and King Pest (two of my favorite and too-often-overlooked works of his). The home where he lived when his MS. Found in a Bottle won $50 dollars in a short story contest for the local paper, helping to jumpstart his writing career. 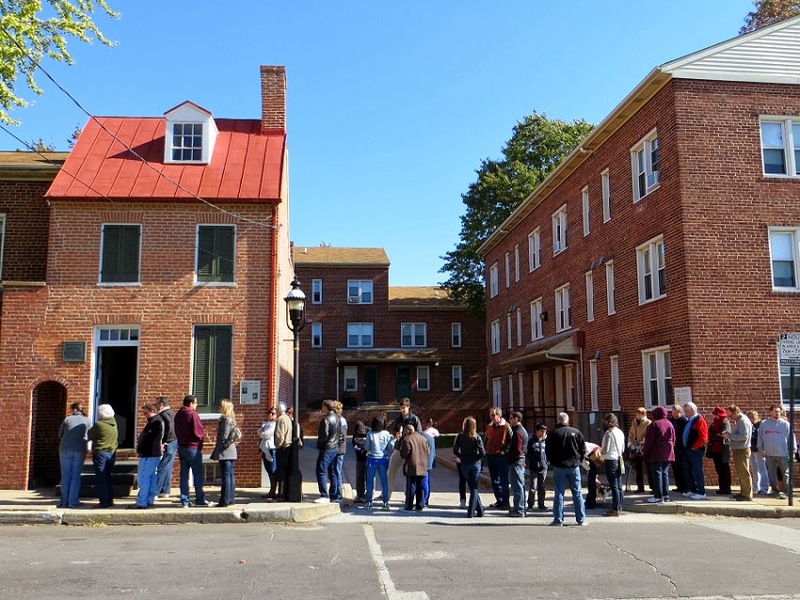 Fortunately the line for the Poe House moved pretty fast. Unfortunately, that’s because there’s not much to see inside. 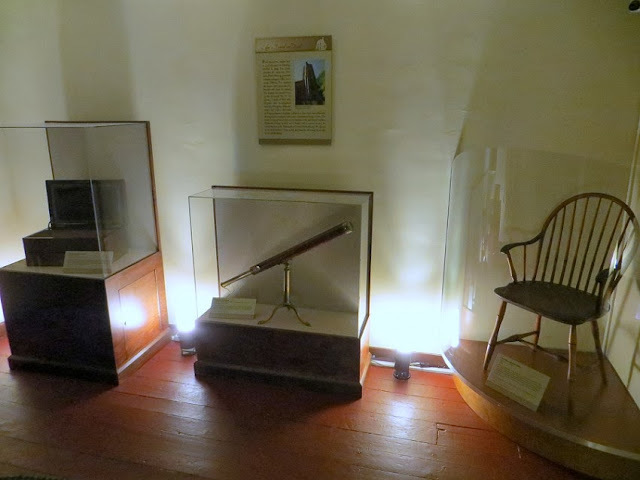 A tea set, a telescope, and a chair…all of them related to Poe to varying degrees, the two former of which being possessions of his foster family, the Allans, and probably used by Edgar, and the chair being supposedly his. The most interesting item is the small, portable writing desk that, while also the property of the Allans, might have been taken with him during his short stint as a student at the University of Virginia. 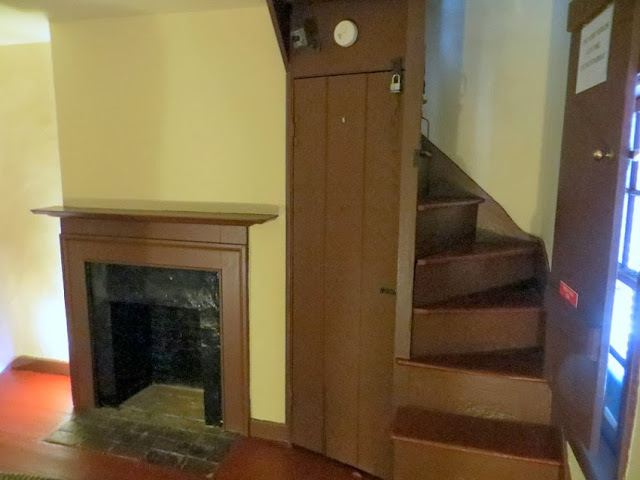 Poe’s room is in the attic, and only one person at a time is allowed to slither up the narrow, ladder-like steps to poke their head over the glass barrier that prevents entry and peer around. 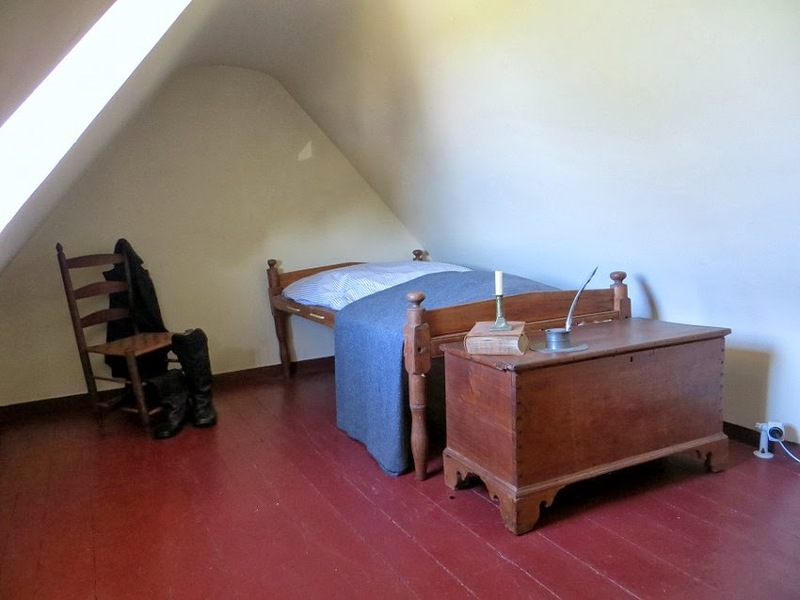 It’s furnished with period pieces. But that’s cool. The house itself is really the artifact. 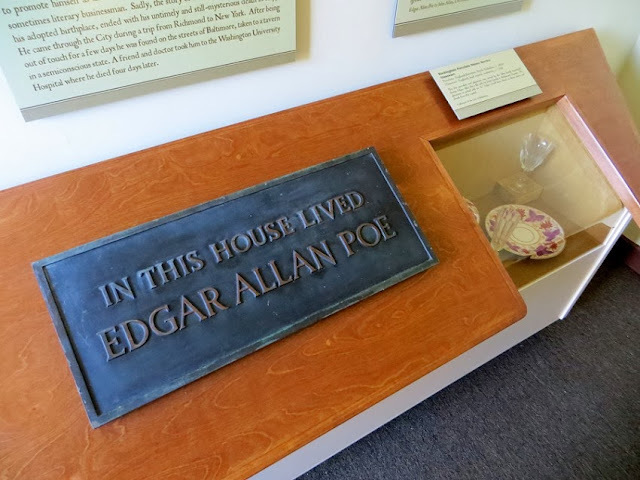 And it’s only one of three of Poe’s homes still extant in the country, the other two being in the Bronx and Philadelphia. 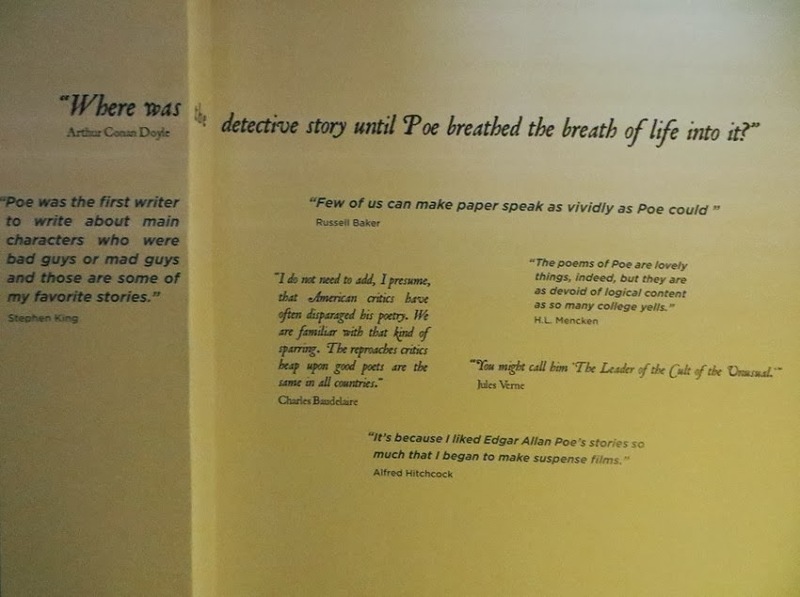 And maybe that’s two more than most famous authors get, but still this is Poe, we’re talking about here. I’ll go deeper into my my experience at the Poe House in my book, but the point here is that no longer do I have to feel the weighty, private shame every time I read about his life in Baltimore, see a Ravens game on TV, or travel home for the holidays. I’ve now trod the boards of Poe’s house. Squirmed up its tiny staircases. Stared at its bare walls like I assume they did in that pre-television era. Basically, I’ve been to what should be one of the most touted places in my home state. Maybe when it opens next year, it’ll finally become that. Oh, and, so you know, I wrote most of this post in an airport bar playing Cream’s greatest hits after three amaretto sours and having just read the chilling ending of Thomas Tryon’s Harvest Home. So if the mood of this post reads weird that’s why.